After viewing a show on the Food Network that featured “surf and turf” it got me thinking about what I might make for dinner. I headed to the deep freeze wondering what might pair with the large jumbo shrimp I planned on preparing and found a couple of flank steaks that I had on hand deciding this was it! 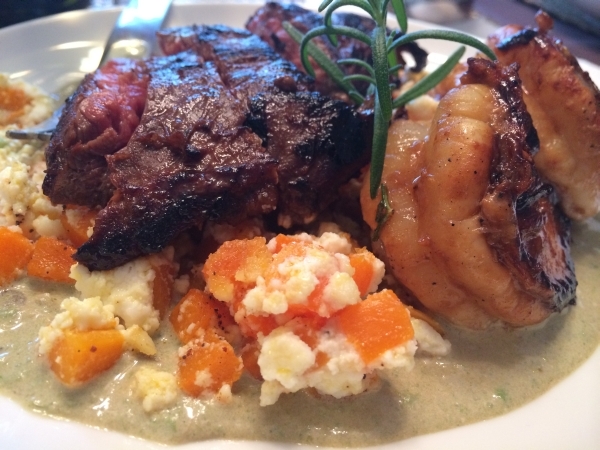 Flank steak is technically not a steak, it is the belly muscle of the cow and is typically cut into small pieces. 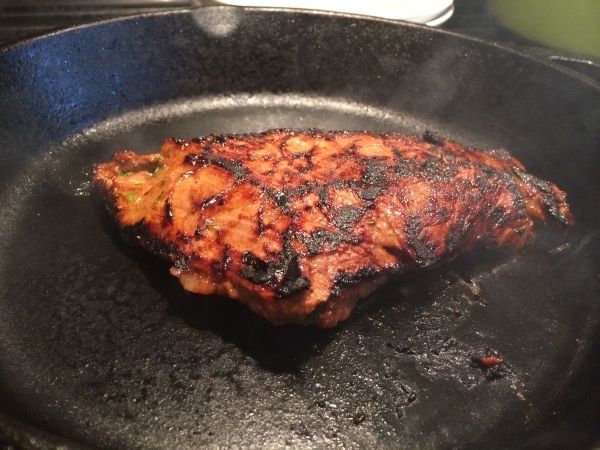 It has become very popular with the mainstream introduction of fajitas and can be found in most grocery stores. 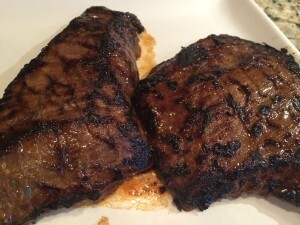 I pick it up at Costco for a fair price and really like this cut of beef. It contains almost no fat and can be tough pretty much no matter how you cook it if not done right. 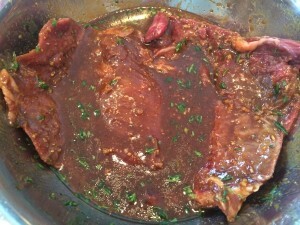 To make it tender it needs to be braised or marinated. If you grill it hot and fast and it will be fantastic, but the secret to a tender flank is to slice it super thin against the grain. I hadn’t know that traditionally, this is actually the steak known for the dish London Broil. It sounds fancy and really isn’t very expensive. 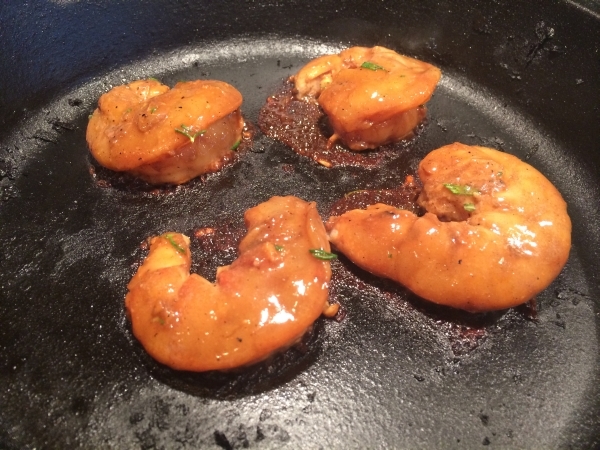 I almost always use an Asian inspired marinade and wanted to change things up this time. 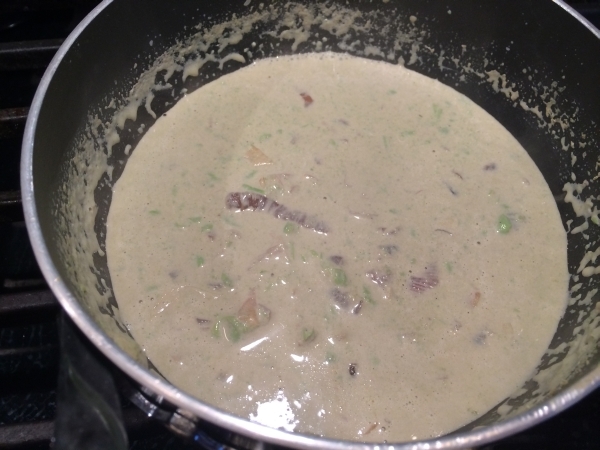 This recipe is courtesy of the show “Home for Dinner with Jamie Deen” and the “Dad Food” episode. The Molasses sounded good as the sweet with some sour and I had everything on hand in the fridge and pantry to give it a try. 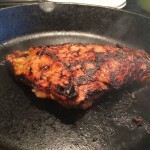 We did like it, but wished I had marinated it a bit longer. I think if I prepare it this way again that I would add more Soy Sauce. I tasted more sweet then anything and both Bill and I commented that we didn’t hardly taste the Rosemary as much as we would have liked. 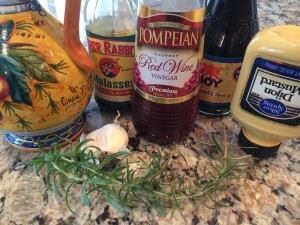 Whisk together the molasses, vinegar, mustard, soy sauce, olive oil, garlic, and rosemary. 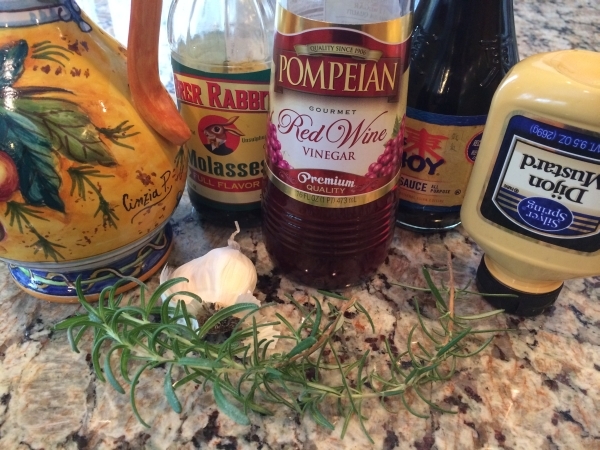 Pour the marinade into a bowl or a large ziptop bag. 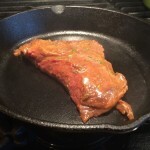 Add the flank steak and turn coating with the marinade. Place in the refrigerator for four hours (or at least one hour if time is limited). Remove the steak from the fridge at least 30 minutes before grilling to remove the chill. 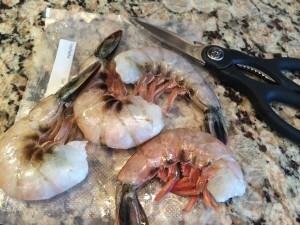 Clean the shrimp and add it to the marinade. 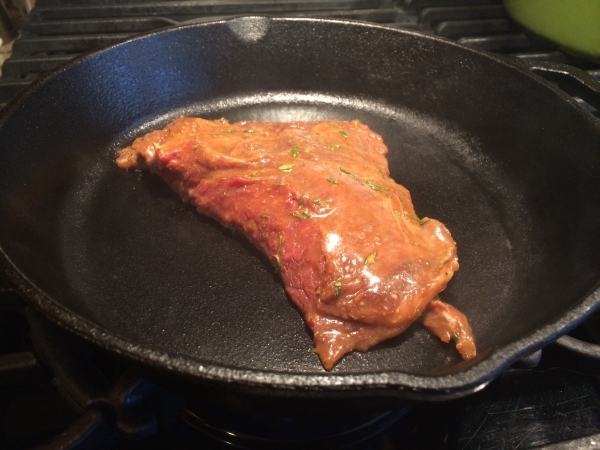 Heat a cast iron pan or grill outdoors over medium high heat. Remove steak from the marinade letting excess drip off. Season the steak well with salt and pepper. I cut the steak in half since I was cooking it in the cast iron skillet. Grill steak on each side for five to six minutes per side. Cover and allow to rest for ten minutes before slicing across the grain. 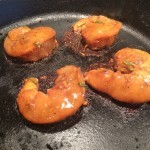 Cook the shrimp in the same cast iron skillet over very high heat for about three minutes on each side. I had some Ricotta Pea puree left over (that I had made by simply by microwaving peas according to the package directions, until just tender. Draining them and adding them to ricotta, butter and a pinch of salt in a processor to make a slightly chunky puree.) 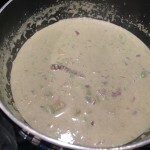 I combined it with some caramelized onions and half and half and cooked it over low heat until it was reduced and thick. I used this as a sauce base that was topped with roasted butternut squash, tossed with ricotta served along side of a side salad. 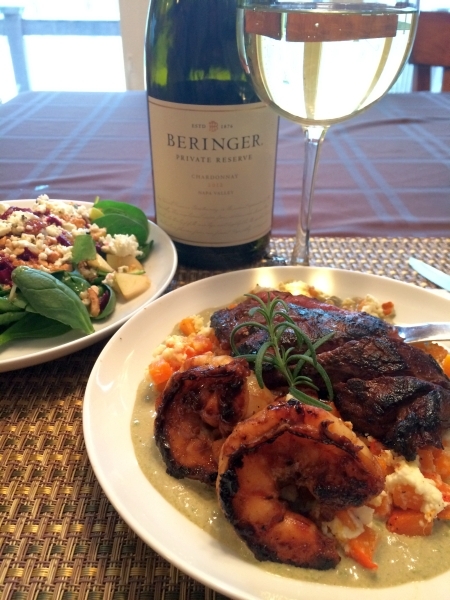 It paired beautifully with the 2012 Private Reserve Berigner Chardonnay!